When a Bronze Age conqueror steals the home of a tribe of cave people, they challenge the Bronze Age football champions to a match. If the cave people win, they will get their land back, but if they lose, they will be forced to work in the ore mines for the rest of their lives. Oh boy, an underdog sports story. We wonder who's going to win?! "Early Man" is the latest film from Aardman Animations, who have produced films like "Chicken Run," "Wallace & Gromit: The Curse of the Were-Rabbit," and "Shaun the Sheep Movie," among other things. It is directed by Nick Park, who directed the aforementioned "Chicken Run" and "The Curse of the Were-Rabbit." It stars the voice talents of Eddie Redmayne, Maisie Williams, Timothy Spall, Richard Ayoade, and Tom Hiddleston, just to name a few. 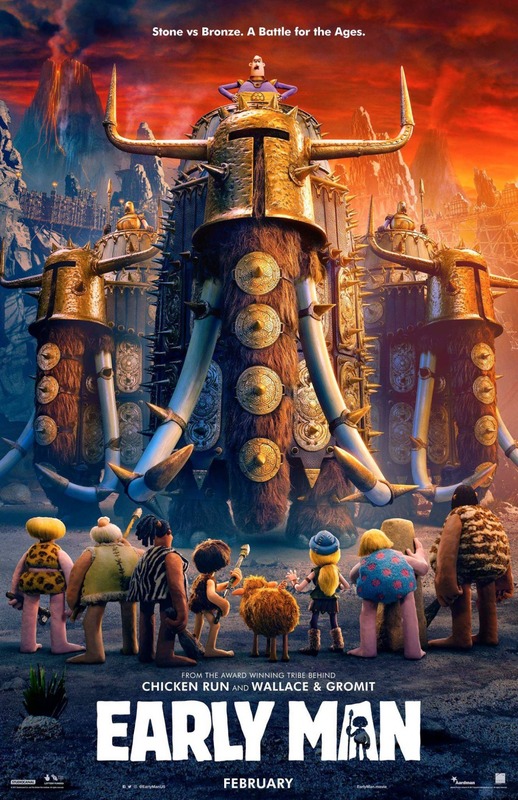 The story centers around a primitive caveman named Dug (Redmayne) who dreams a little bigger than most cavemen. When a Bronze Age noble named Lord Nooth (Hiddleston) seizes the cave people's valley, Dug's tribe is ejected to the Badlands. After witnessing a game of football, Dug challenges the Bronze Age champions to a match and makes a bet with Lord Nooth that if Dug's team wins, they get their valley back. If they lose, however, the cavemen will work in the ore mines forever. Now, Dug must find a way to train his tribe, who have never even seen a football much less played the sport, to beat the best football team in the known world. We are huge fans of stop-motion animation. Aardman Animations movies tend to cater to a slightly younger audience than other stop-motion studios like Laika, but we have still adored several of their titles. Having been fans of several of their past projects, we had pretty high hopes for "Early Man." Honestly, we are a bit disappointed with it. The animation and overall look of the film are splendid, as to be expected, and there is even some witty humor that we liked throughout the movie. Much of the humor, though, falls flat despite a couple of big laughs. At its core, "Early Man" is a very standard underdog sports story. We have a ragtag group of misfits who have no skills in the field they need to compete (with the exception of one ringer), but they have a strong sense of togetherness and teamwork. They must compete against a highly skilled group of individuals who are bigger, stronger, faster, and more talented, but don't work together and are more concerned about their own individual selves rather than the whole of their team. See movies like "Little Giants," "The Mighty Ducks," and "Space Jam" for more stories just like this one. The only aspect that sets "Early Man" apart from the rest of the group is its neolithic environment. Much of the humor has to do with its prehistoric/early history setting, which is really the most enjoyable part of the film. Unfortunately, the funniest joke of all is a one-off line that is spoiled in the trailer, but we won't spoil it here just in case you haven't seen it. In the end, "Early Man" has the same gorgeous, detailed animation we've come to expect from Aardman, but it has a predictable, paint-by-numbers narrative that disappointed us. There is just enough character development and charm to make it decent enough watch, but we can't fully recommend it. Heck, even the voice-over work here is pretty average. At least the character Hognob kept us thoroughly entertained.